Here's the Mr. Milk Bottle sign in Pomona. 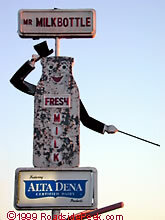 This milk bottle sign features a smiling bottle with a toip hat. The little guy points the way into the dairy itself. See more of these dairy delights at Roadside Peek's Roadside Dairies Southern California.